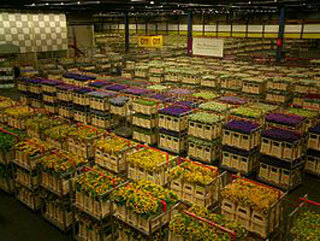 Aalsmeer Flower Auction (Bloemenveiling Aalsmeer) is a flower auction that takes place in Aalsmeer, Netherlands. It is the largest flower auction in the world. The Aalsmeer Flower Auction building is the second-largest building by footprint in the world, covering 518,000 square metres. Flowers from all over the world - Europe, Ecuador, Colombia, Ethiopia, Kenya, and other countriesare traded every day in this gigantic building. This article uses material from the Wikipedia article "Aalsmeer Flower Auction", which is released under the Creative Commons Attribution-Share-Alike 3.0 License.